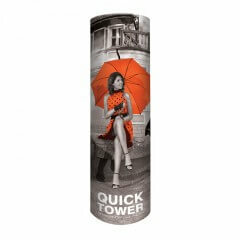 E-Quick pop up displays have a robust framework which is made with wider than usual tubing so graphic panels fit better and go on fitting better. Magnetic locking arms and magnetic fixing bars make the E-Quick pop up fast to assemble and reliable – no clips or catches to break. 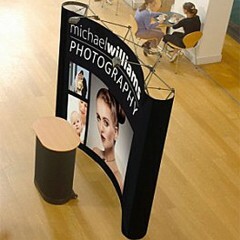 E-Quick pop up frames come straight, curved, L-shaped and as towers too. £810.00 need help? contact us! £530.00 need help? contact us! E-quick pop-ups Pop-ups cover all the bases offering curved, straight, L-shaped and tower configurations. 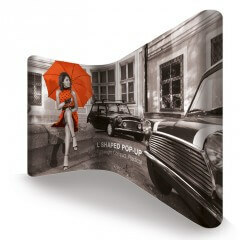 Pop-up stands are the second most popular portable exhibition display. Frequently seen in shopping malls and airports pop-ups do have a fairly large footprint but are large, architectural and impressive. Pop-up display systems have collapsible frames and graphics attached by magnetic strips.